New proposals are welcomed for both single-author volumes and edited collections for the Ashgate series Women and Gender in the Early Modern World. For over a decade the series has published innovative research on all aspects of the field. The series includes titles on the family, on education, poor relief and religion, on lactation, menstruation and procreation, on Queenship, the book trade and on Ottoman women builders -to name but a few. 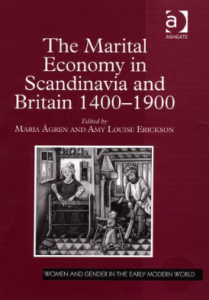 Readers of this blog will no doubt be familiar with the excellent volume The Marital Economy in Scandinavia and Britain 1400-1900 edited by Maria Ågren and Amy Louise Erickson.